Sorry, all too small for me, and SWMBO has to get to grips with a 2 crest Solway zipper arriving later today, I think she said 'one in, one out' when the International arrived. My girlfriend has come to the point of just not caring when I get a new jacket. I pulled the old 'Oh, I've had this one for ages!' trick the other day when she asked about my new Musto coat. Seeing as you seem to have this disease pretty badly have you ever tried making your own wax from 2 parts beeswax, 1 part boiled linseed oil and one part turpentine? Don't throw it away! How bad is it? I haven't tried, I'm too used to the Barbour wax. This bad; the shoulders, the top of the arms, the top half of the back are intact, the main zip works but the rest of it is gone. Question about shortening sleeves on Barbour Bedale. I have a 38 inch chest and purchased a new size 36 online after reading that they run big. The jacket is still quite big on me and very roomy for any layering that I may need to do. Wouldn't want to size down anymore though. I'm short at 5'5 and the sleeves are 1 1/2 to 2 inches too long on me. I priced out sending it to Barbour to shorten sleeves but with shipping etc. it will cost almost as much as I paid for the jacket. Cost seems a bit excessive to just get a little fabric removed. I don't need the storm cuff adjusted or anything tricky, just the outer sleeve shortened. Any real issue with taking it to a competent tailor and then waxing the new seams myself? It looks like a pretty basic alteration that doesn't need to be that expensive. Thanks. That should be possible with a local tailor or seamstress. It might be worth asking them to put a small strip of leather on the edge of the cuff to stop them fraying. How much shorter do you need them? Ok. That's what I thought too. Interesting about the leather and fraying, definitely have talk about those options with tailor. Don't have accurate measurement but when I turn up outer sleeve to make arm length look proper it's under 2 inches. Still leaves plenty of material over storm cuff. Don't forget about the knitted cuffs. They may need to be moved, too. I'm downsizing big time. A few jackets are up for grabs! I'm interested. I'm sure you've posted pictures before but care to upload some or send me a few. Also would you be able to ship to US? Anyone familiar with the Bransdale? Is it made in the UK? 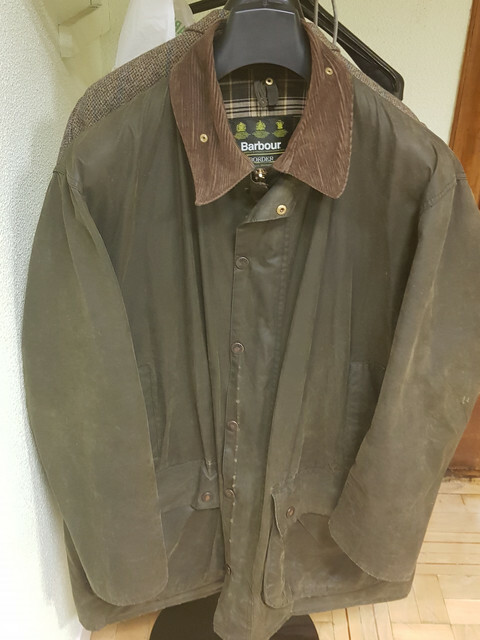 not to plug just for business, but I could really hook a couple of y'all up if any of these vintage Barbour jackets pique your interest. Also, about making your own wax - I am going to have to give that a go. 1 part turpentine, huh?